September | 2010 | Lipogram! Scorecard! The Purple Line Express by itself is enough to inspire your music group to title itself in honor of El lines or buses. Dempster? Wells? Welington [sic]? Unless you get sued, which stinks, it’s truly inspiring. Riding through “Dempster” seemed to be ominous–like, it’s some sort of omen. It turned out to be just ominous. We got out before Belmont, where the purple line would continue to if the Cubs were off, so didn’t get close to Wellington or Wells. Our long climb to the 500 level worked out well, since we were shielded from strong winds, but we didn’t get there for the lineups. The first visiting hitter used to be on the Cubs; forgetting he’d left, I didn’t write him down. By the time Cubs got up, they were losing 1-0. Their positions sounded less blurry to begin with, but throughout the night there were lots of substitutions which sounded pretty blurry. Lots of them were defensive, so I couldn’t just look for their numbers. So, my scorekeeping didn’t work out perfectly. The second inning. Oh, the second inning. Jose Guillen led off, getting hit by two of Dempster’s pitches–there is precedent for this sort of thing, but not much. (Guillen is the fourth to do so.) Their pitcher got two hits. The reliever surrendered four RBIs on one swing. Guillen led off the fourth. (Innings three through ten, unsurprisingly, I crossed off keeping score, putting n-1 in the box n previously occupied.) This time he got his own hit, but did not come in. He would’ve led off the sixth, too, but Schierholtz pinch hit for him. Pity. Could’ve seen him go for some record. They didn’t. Not even with Welington pinch-hitting in the ninth. There weren’t long lines to get on the Red Line, either. But I still think you could write CDs from these stops. Even if “Dempster” is dirgelike. And let the net guess. I don’t like E’s here! No one likes to see. Is a weird fall fate. The Twins could pull one off now. I should go watch. Bye! Unless the opposing pitcher is on your fantasy team, there’s really almost never a bad time for your team to get hits. There are times when it would be really, really nice for them to get hits, and then times when it’s not so important, but hey, the more the merrier. Fantasy aside, can we therefore conclude that it is always good for your team to get hits, and always the best course of action to root for them to do so? No, we cannot. For we also appreciate the home fans we see in broadcasts of no-hitters we switch to, who start cheering for the visiting pitcher at the end of the game–tacitly rooting against their own batters. But when does the “end of the game” begin? When is it acceptable to switch your allegiance? Enter the ZACK, a new statistic that hopes to measure the acceptability of rooting for a no-hitter against your own team. This is the first version of the formula, so the scale of some of the numbers involved might be off. Feel free to give feedback. …but you just started paying attention because someone has explicitly told you what’s going on, step away from the computer (or open a new tab), and give that person a stern talking-to from me. Subtract that original 8 from your A value if your team has gotten on base through other means. Crucial. This is the hardest to calculate, and the one that might need the most fine-tuning. I apologize in advance. The first thing to do is see if your team has either clinched a playoff spot, or been eliminated from playoff contention. If so, C=9. Go directly to K. If it hasn’t, continue below. However, if the value that you get from continuing below is greater than 8.5, use C=8.5 instead. Okay, so your team is still in some sort of race; it’s either leading the division or the wild card by x games, or it’s x games out of the division or wild card (consider whichever case makes x smaller–usually you’re closer to the wild card than the division title). If you are playing the team chasing you by x games/in first by x games, go to the next paragraph. Otherwise, take x/2 and go to the next paragraph. Okay, now you have C. Unless this value is greater than 8.5, remember, in which case C=8.5. Killed. 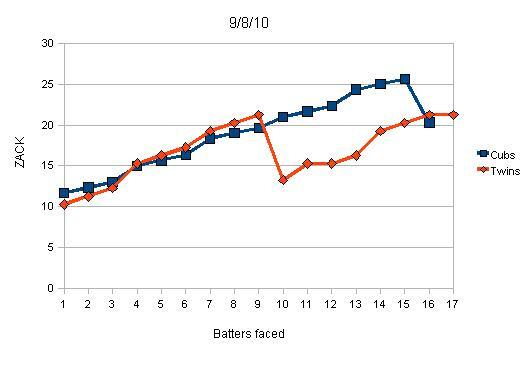 K increases by 1 for each run, beyond the second, your opponents have scored. I originally considered tweaking this, as your team is not necessarily getting killed out there even if your opponents have scored more than two runs. However, I think the novelty factor of watching your team score without getting hits offsets this. All right, we’re done! Multiply Z*(A+C+K) to get your ZACK score, and then root away. What’s that? You’d maybe like an example or two to help with the numbers and stuff? That’s fine. For a couple of examples, we will take two games last night; the Twins game against the Royals I attended (you will never guess who was pitching for the Royals. Never. At all), and the simultaneous Cubs game against the Astros. Both the Twins and Cubs qualify as “my team”. First, let’s get Z and C out of the way, as we can do that early for both teams. (I suppose in late September C could change while the game is going on, if another team loses/wins at the same time; again, if this will dramatically alter your result, you have other things than ZACK to worry about at this point.) I was at the Twins game, so Z=1 there, but the Cubs were already losing by the time I started glancing at the scoreboard, so Z=2/3 there. C for the Twins? They entered the game with a 5.5 game lead over the White Sox, so x=5.5. They weren’t playing the White Sox, so 5.5/2= 2.25. It’s September, so that’s all there is to do to find C.
Am I on the right track? There’s a lot of room for improvement, but I feel like this is a good start. By the way, I’m not going to give you a cutoff value for acceptability, except that I’m pretty sure it’s greater than 14. Beyond that, it’s an issue that each fan must struggle with alone. Also, although it should be obvious, don’t bother with ZACK once your team has already gotten a hit! Then, just sit back, enjoy, and hope the barrage continues for enough runs that Matt Capps can’t blow it.